Isn’t this a beautiful cover? Six years ago, I read this blog post of Matt Cheney’s and thought, “Wow, he sure is heaping a lot of praise on what seems like a very dull and cliched book.” I mean, here’s the plot description from Amazon. Does that not sound like the most boring book ever? It sounds like every professor novel I’ve ever read: right off the top of my head, I’m thinking of The Human Stain, The Dying Animal, and Disgrace. (And believe me, after reading it, I can tell you that this book hits every single cliche of the professor novel.) A dull, sexless wife; political infighting in the department; an affair with a student; despair at academic work that is never quite as good as it should be. I mean, come on. How could this possibly be good? Anyway, although I never intended to read the book, it stuck in the back of my mind and when I came across a copy of it, three years ago, I grabbed it. I carried that book around for three years without ever thinking about reading it until that fateful day (last Wednesday), when I was scrounging around for something to read and I read the first page of Stoner and was hooked. I read the first quarter of the book and if I was still nineteen, I’m sure I’d have stayed up until 3 AM and finished it that night. The next day, I was almost afraid to read it. I was sure that the magic would’ve deserted it. I cannot reiterate how incredibly cliché this novel is. And age is no excuse. This book was written in 1975. These things were cliché even at the time of writing! But this book ennobles the clichés. I really don’t know how the author did it. I’d like to say that the writing was spectacular, but, honestly, I’m not sure it’s better than that of Philip Roth or J.M. Coetzee. But, despite that, John Williams has produced a better book than the ones they wrote on a similar topic. I think that perhaps the magic lies somewhere in the narrative standpoint. In many ways, this book’s closest relative is Tolstoy’s The Death Of Ivan Ilyich (which starts after the death of a middle-aged civil servant and then flashes back to show, and try to justify, his life). This novel does the same. Its first page is a perfect and perfectly terrifying evocation of the insignificance that befalls its protagonist after death. His only marker is a book donated in his honor to the university’s rare books archive. No one remembers him. No one mourns him. But where Ivan Ilyich is cruel (Tolstoy shows us that the protagonist’s life had no meaning or worth), this book avoids judgment. 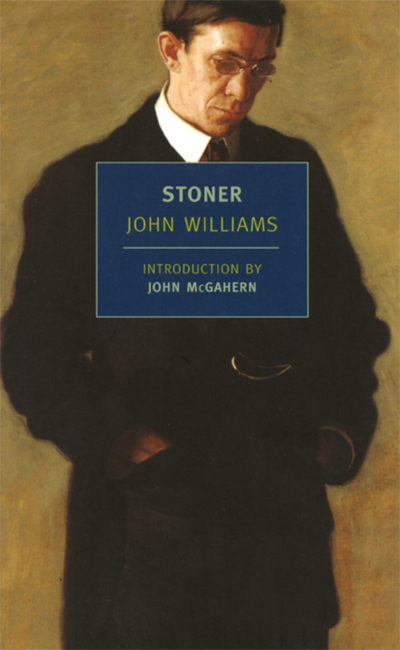 It views the events of the life of the protagonist, William Stoner, from this tremendous narrative distance. We see him born, grow up, become educated, get inspired by literature, take his PhD, marry, teach, become a parent, have a father, have an affair, and die…but we don’t feel it. There’s this sense of distance from it all. The novel doesn’t tell us what to think. There is a sense in which Stoner’s life is a waste. He produces no academic work that’s of any worth. His family life is miserable. And although he’s a good teacher, there’s not much sense that he’s fondly remembered by tons of students. And yet, the reader resists that interpretation. There is something to Stoner. There are many people in the world who die with even less to show for it than he does. Nor does it seem like his life is unhappy. There’s a quietness to it. Nothing can hurt him that much, because he’s always capable of retreating into himself and finding new reserves of strength. Reading this novel was not only a surprising experience, it was an inspiring one. It reinvigorated my belief in the power of literature. I’m not sure that I believed, before reading this book, that there could still be a novel like this: one that had grand ambitions but was written unpretentiously. To be sure, I knew that it was still possible to write clever and interesting novels, but I wasn’t sure it was possible to write simple ones. Sometimes it feels to me like irony and parody are the only ways to reinvigorate this forest of dying tropes. But at least while I read this novel, I felt, for a moment, like it was possible to say and do something new. He was born in 1891 on a small farm in central Missouri near the village of Booneville, some forty miles from Columbia, the home of the University. Though his parents were young at the time of his birth–his father twenty-five, his mother barely twenty–Stoner thought of them, even when he was a boy, as old. At thirty his father looked fifty; stooped by labor, he gazed without hope at the arid patch of land that sustained the family from one year to the next. His mother regarded her life patiently, as if it were a long moment that she had to endure. Her eyes were pale and blurred, and the tiny wrinkles around them were enhanced by thin graying hair worn straight over her head and caught in a bun at the back. *Previously, the best novel was Nancy Mitford’s The Pursuit Of Love. I feel a bit bad about dethroning it, since it is everything that Stoner is not: original, witty, written by a woman, and, well, just a hell of a lot of fun. The best work of non-fiction that I’ve read this year is, of course, Arlene Russell Hochschild’s The Second Shift. The difference between good writing and great writing. You were an early fan of this one.